Go give an order to a cloud. If the cloud obeys you, then I will. Jed is an awakened tower with golem-like qualities. It was reconstructed from the Tower of Jenga shortly after Parson Gotti upgraded the city of Spacerock. Stanley the Tool lives in Jed's hat. The Jed Eye Knights live behind Jed's eyes. In his experiments with caster links, Parson wanted to see if a Dirtamancy/Dollamancy caster link could turn a tower into some form of enormous golem. During the link-up, Sizemore, Ace Hardware, and Maggie agreed that, due to the intrinsic nature of the tower, it would be impossible to imbue the tower with motion. But they also realized that other possibilities were open to them. They discovered that towers actually have primitive minds, and they were able to awaken Jed into sentience. Using Dirtamancy and Dollamancy's power to build golems and reshape cities, they were then able to let the tower pick out a new appearance for itself. Among other things, the tower remodeled Stanley's office to have a tiki bar and a hot tub. The tower is now able to manage itself and see to its occupants' needs. It takes an active role in managing the defense of the city, being aware of what units are present in and around Spacerock and suggesting additions to Stanley. Speech, through internal heads and masks as well as its external mouth. Manipulate the faces of its many masks. Highlight items within itself with a white aura. Observe its occupants and sense their mood. At the bar, suggest cocktail-recipes. Unspecified elemental powers it can use to protect the city. Sense that the Juggle Elves were using destructive foraging in Rightshoring territory. Steal juice from The Source for Maggie. Stanley can detect no upkeep for the new structure, and Parson's attempts to view its stats through the 3D Glasses are evocative but uninformative. Jed uses his own set of words when referring to people and things. They are various words and phrases from the Hawaiian language. This table is roughly in the order that the words appear within Erfworld. Wahine Lele Bonnie Wahine = woman; Lele = to fly, jump, etc. The tower has largely been described in archetypal terms. Archeologists think that in Real World ancient Polynesian religion, objects like the Moai were believed to be magically charged with mana. Perhaps Jed the Head has its own juice pool rather than being filled with spells by casters. 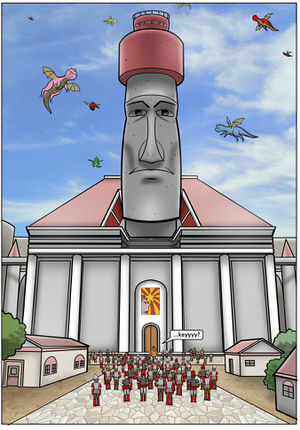 The tower is shaped like the Moai of Easter Island. A Djed pillar is an ancient Egyptian symbol representing stability; it was often combined with a pair of eyes in hieroglyphics to represent Osiris. The name Jed means "Friend of God". Jed sprinkles its speech with Hawaiian words. This page was last edited on 25 April 2018, at 09:38.